Different locations have different labour markets, this means that people have different employment opportunities based on their location and importantly may have different awareness of different kinds of jobs. In addition different places may be marked by different ways of being, different expectations and different values which may impact on the choices people make. Decisions about career pathways for young people in remote areas will almost always involve consideration of moving or staying. Young people may be more or less comfortable with migrating depending on their personal history (especially how much they have moved around in the past), the existence of friend and family networks in other parts of the country (or the world) and how confident and / or motivated they are. The exercise generated some really fruitful discussion about how careers advisers work with rural young people – something I’m hoping to write more about in the future. So if you are reading this and have any further thoughts I would be interested to hear them….! Categories: Uncategorized | Tags: Careers Research Symposium, Napier, SDS, Skills Development Scotland | Permalink. Having spent some time at the Career Development Institute conference a couple of weeks ago, and hearing quite a bit about the careers landscape in England, I have decided that now might be the time to digest some of the policy landscape around Scottish careers provision. The revolution in Scottish careers really started back in 2007 with the publication of the Scottish Skills Strategy (Skills for Scotland: A lifelong skills strategy). This introduced a specifically Scottish take on skills, learning and careers, starting by identifying how compared to England Scotland has higher levels of qualification (with more people qualified at degree level than with a basic school leaving qualification), but lower levels of productivity. In Scotland, therefore the skills picture is complicated: higher levels of skills haven’t necessarily led to higher productivity, and so, the Skills Strategy lays out a new approach, focused on ‘Skills utilisation’ rather than simply skills acquisition. The resulting document is ambitious. A key point is how individual needs and employer / economic needs are given equal weighting. There is no tension expressed in the report about conflicting needs of employers and individuals, instead, what is good for the individual in terms of the workplace knits neatly with what is good for employers.The rationale here is about utilising skills in the workplace: it is proposed that with better skills utilisation of the workforce, productivity should increase; and better skills utilisation for individuals will enable better career outcomes and greater satisfaction. The vision that is painted in the policy is one where there is no distinction between ‘learners’ and ‘earners’ – so that the learning journey of individuals is streamlined, with more employer engagement in the curriculum, and more learning opportunities facilitated in the workplace. The challenge for the education, skills and careers systems from this policy are substantial, and as the policy points out, requires the development of much more cohesive structures, so that employers and education / careers providers ‘speak’ to each other much more clearly. In the context of the financial crisis, in 2010 the policy was updated with the publication of Skills for Scotland: accelerating the recovery and increasing sustainable economic growth. This policy document lays out a more practical vision, summarising what has already happened in achievement of the original policy and outlining key areas for development. This is a critical point, and one of the defining features of the Scottish careers and skills landscape: guidance services are central. However, these guidance services are radically reimagined in terms of their enhanced remit as facilitators between employers and individuals. Now, careers services have always understood the need for employer engagement and labour market information in order to provide strong services for clients. However, in the current Scottish landscape the role of the lead careers agency, Skills Development Scotland, goes further, not only are they the lead agency for delivery of guidance, but they are also the key agency for bringing together labour market information, employer and skills intelligence. They do this in partnership with other agencies, for example, the Scottish Framework for Careers (2011) identifies the role of AGCAS, Jobcentre plus, colleges and other organisations for the delivery of guidance, and the revised skills strategy mentions the key role of the Sector Skills Councils in terms of labour market information. However, it is notable that SDS sits centrally in both the guidance and the skills landscape, and indeed from that perspective, simply their organisation name ‘Skills Development Scotland’ reflects this intermediary position. In practice therefore, SDS sits centrally to a great deal of the skills landscape in Scotland, but works collaboratively with other organisations. The way the system works may be summed up in the ‘Scottish Skills Planning model’. As can be seen in the diagram, data and analysis of skills needs are central, and influence both Careers IAG and the funding of education and training. 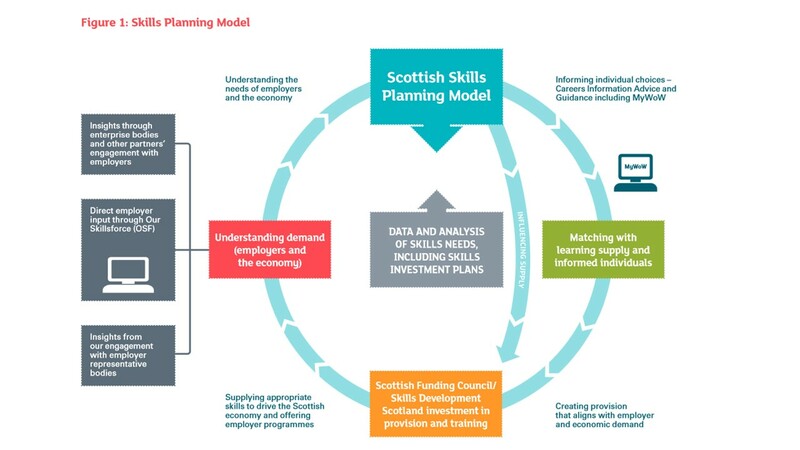 In Scotland the key vehicles for this process are the Skills Investment Plans – which are documents drawn up by SDS in collaboration with other agencies to identify the skills needs and future priorities by both sector and region. Education and careers provision is then expected to be designed in relation to these plans. It is notable that there is both a regional and a sectoral focus to these plans. The regional focus ties in to the identification of different geographical needs of both employers and individuals. Alongside the regional SIPs the policy document also outlines the role of Community Planning Partnerships and the Single Outcome Agreements (which are developed between the CPPs and the Scottish Government) in order to set out regional outcomes and priorities in terms of education, skills and employment. The sectoral focus is linked to the Government’s economic strategy which identifies key sectors with high growth potential and the capacity to boost sustainable growth. These are: financial and business services, energy, tourism, life sciences, food and drink, the creative industries, universities. Although the impact of the SIPs on guidance and education planning has not really been seen up to this point (because they are so new, you can see the existing SIPs on the SDS website), one thing that we have already seen in Scotland is an increase in the language of skills in guidance and in education. In particular, the Curriculum for Excellence has been a radical restructure of the curriculum within Scotland, and aims to “ensure that all children and young people in Scotland develop the knowledge, skills and attributes they will need if they are to flourish in life, learning and work, now and in the future.” This focus on knowledge, skills and attributes, and on the holistic development of the young person has notably also been found in the new Career Management Skills Framework for Scotland (SDS, 2012) which identifies four sets of career management skills: Self, Strengths, Horizons, Networks. This framework has specifically been developed with the aim “to build on the firm foundations of skills for young people established within Curriculum for Excellence.” (SDS, 2012:1) Although it remains to be seen what impact the SIPs have, it is clear that already careers and education provision is becoming much more closely aligned. The impact of the Scottish skills strategy is still to be felt, I think. However, with the recent release of a number of Skills Investment Plans, and the development of the Scottish Career Management Skills framework there is likely to be a great deal of development within the sector in the coming years. One thing that is certain is that the Scottish vision is radical in the way that it: reimagines the role of labour market intelligence and data at the centre of both the guidance and education systems; brings the careers and education systems much closer together; and gives employer needs a stronger voice in both systems while not neglecting the importance of the individual and their choice. Categories: Uncategorized | Tags: Curriculum for Excellence, Education, IAG, Scottish careers framework, Scottish Policy, SDS, Skills Development Scotland, Skills for Scotland, Skills Investment Plans, skills planning model, Skills Strategy, training | Permalink.